The 1910 T210-3 Old Mill Texas League Series 3 Baseball Card Set contains 95 cards measuring 1 1/2" x 2 5/8". All T210 Baseball Cards feature a "red border" on the front of the card framing a black and white photo of the player. The back of the cards contains an advertisement for Old Mill Cigarettes and the series to which the card belongs. The T210 baseball card set featured solely minor leaguers, and the T210-3 set includes players from the Texas League. Most of players in the 1910 T-210 OLD Mill Set never made it to the majors and this set represents their only appearance on a baseball card. The only notable players from T210-3 Texas League set are Hank Gowdy and Everett Hornsby (brother of Rogers). 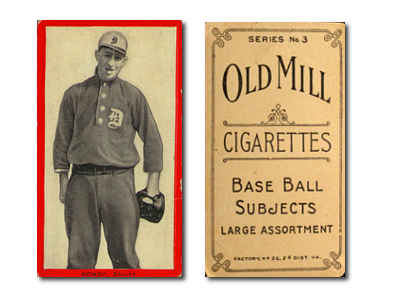 CLICK HERE if you want to sell your 1910 T210-3 Old Mill Texas League Series 3 Baseball Cards.